6 Te-En = 10 En-Mi = 16 Mi-Te which is a 3:5:8 ratio (3,5 and 8 are Fibonacci numbers). 1 d-e = 2 c-d = 3 c-e (1,2 and 3 are Fibonacci numbers). Phi is nature’s way of pulling order from chaos. It is the counter to entropy that has created everything from atoms to Life. I’ve elaborated my speculation on phi in the form of a conversation – with myself, if you like. b,c and c,e are ‘neighbour’ planets and b,e are not. The non-neighbour pair is always the sum of the two neighbours. In the Fibonacci series any two consecutive F numbers always sum to the next one in the series, e.g. 2+3=5. The Fibonacci series starts like this: 0,1,1,2,3,5,8,13 etc. African violet (from the first link) – the positions of the numbers on the right show maximum leaf exposure to sunlight and rain. You can see phi as fibonacci relative to year of 365 days with Venus where the synod is 8/5 and the orbit is 8/13. If you follow this trough you see that the solar year effectively reciprocates the orbit and the GM has that unique property of reciprocated without losing its fractional part. 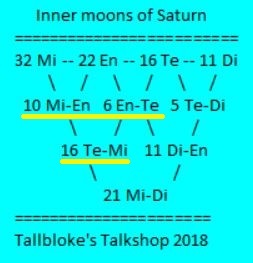 Since my Matrix of Creation (2002), the musical resonance of the two visible outer planets, Jupiter and Saturn, as 9/8 and 16/15 relative to the lunar year i.e. 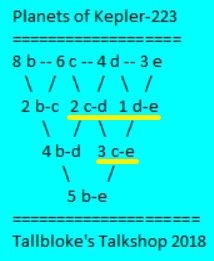 whole and semitone intervals, took until 2014 to place properly in ancient near eastern tuning theory (see my Harmonic Origins of the World). Obviously Phi relations derive from its fractional uniqueness whilst musical ratios derive from integer relations within resonance providing a stable state for the group of moons. A number of features in Saturn’s rings are related to resonances with Mimas. 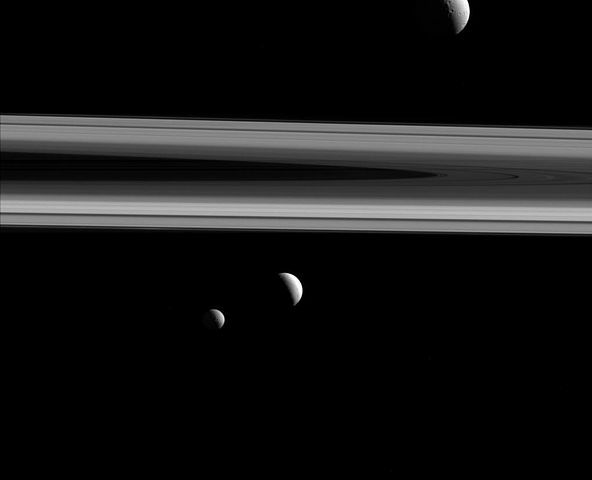 Mimas is responsible for clearing the material from the Cassini Division, the gap between Saturn’s two widest rings, the A Ring and B Ring. Particles in the Huygens Gap at the inner edge of the Cassini division are in a 2:1 orbital resonance with Mimas. They orbit twice for each orbit of Mimas. The repeated pulls by Mimas on the Cassini division particles, always in the same direction in space, force them into new orbits outside the gap. The boundary between the C and B ring is in a 3:1 resonance with Mimas. Mimas clearing the Cassini Division has echoes of Jupiter clearing the Kirkwood Gaps.